Dump trailers are most frequently used for loading and unloading loose material involved in building and construction or transporting sand, gravel or rocks and boulders form one place to another. Farmers and ranchers also use dump trailers as a part of their daily routines. While dump trailer can be a convenient and cost-effective way of meeting the transportation needs of such loose material and handling heavy items involved in building and construction, it is equally important that the ones who operate them know the do’s and don’ts of dumping the load. Any error may result into serious mishaps owing to the nature of heavy work that a dump trailer does. This blog post will walk you through the probable mistakes and factors that could lead to accidents during dumping the load and gives you tips for safely handling and dumping the load from your dump trailer. What can lead to the rollover of a dump trailer? Land terrain plays an important role in maintaining the balance of centre of gravity of dump trailer. A slight variation among the height of tyres on all sides may be fine, but a notable difference would cause a major impact. For example, 3- 4 inches’ difference among the heights of tyres pushes the top of the body by around 12 to 14 inches off from the centre. This would cause the tyres on one side to sink and other side to raise, which is definitely a warning sign of roll over. Heavy gusty winds can adversely impact the dumping process. It adds extra pressure on the tyres and the body causing potential roll over of the vehicle on the whole. Dumping process should be comfortable and as smooth as possible for the driver. Any pressure or force required to dump indicates that the hump will cause strain the overall mechanics of the dumping mechanism and cause adverse side effects. 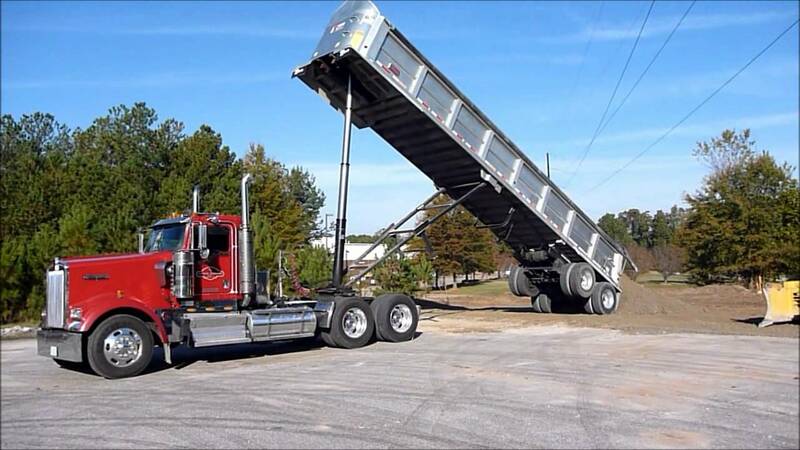 When a driver rises the dump body to discharge the load, the load should be smoothly gliding down the body. Any material that is not moving down or remaining in the body will just add more weight on the body and causes imbalance of forces acting on the dump trailers. This ofcourse is the first and primary thing that every driver has to take care of. The air pressure in all the tyres should be equal and as per the specifications. Any difference in the air pressure in the tyres may cause imbalance in the tires and cause potential accidents while dumping the loads. It is important that the driver knows perfectly the operation of controls and the knick-knacks involved. In case of any doubt or discomfort in dumping, the driver should know how to handle the situation with safety. Overloading the dump trailer is as dangerous as over speeding a vehicle when driving. Overloading beyond the designed limits causes potential problems while dumping and the driver should be aware of the limits of the type of the material and their maximum loads that can be loaded into the vehicle. Now that you have seen the potential causes that could cause problem while dumping, let us talk some tips that every driver should know while dumping the load off the dump trailer. The soil should not be too wet or soft. It should be firm enough to offer resistance to tires on all the sides equally. If the soil is not preferable for dumping, the driver may take the dump truck to a nearby land and dump the load. Remember, safety is always important than convenience. The dump trailer should always be stable and the driver should check this without missing before starting to dump the load. When the dump trailer body is raised for unloading, it is the rear tyres that bear the most of the weight. Hence, before beginning the dumping process inspecting the health of rear tyres is a must. This means the tyres have appropriate air, with no punctures and the level of soil beneath them should be equal with no difference in the heights. Never ignore any signs of wear and tear on the tyres. This will cause an unequal distribution of the entire pressure and may cause imbalance while unloading. Hence take care of worn out treads and repairs if any without any procrastination and negligence. The driver should understand thoroughly to which height the bed can be raised. The driver should know the specifications of rendering trailer and the overall mechanism of the dump trailer body for a safer dumping process. While dumping, the trailer should never be raised too fast. Otherwise, this would create difference in the weights in the back of the trailer and can cause mishaps. It would be wise to take the help of someone to stand at the dumping area and to guide and inform you about the smoothness of the operation and observations if any. In case of any doubt or discomfort while dumping, the driver should stop rising the bed, lower it and check in person if all is well. Only once if all the conditions are suitable, then the driver can resume the dumping process. Remember, under such conditions, lowering the bed should be done slowly too. As we said, look for a safer area to dump where the land I not wet and even with no rocky presence. If the customer insists on dumping however in such uneven areas, it would be good to get in touch with your contractor or owner and explain the situation to them. Thus, if the driver makes it a daily habit of inspecting the health if hydraulic cylinders and tyres, besides keeping in mindall the points discussed here, the dumping process from a dump trailer can be safer and smoother. Author Bio: William L. Vinci is the content manager at warrentrailers.com which specializes in making the best and long-running bodies for the trailers and dump trucks. By using the most modern methods and technology and we have the best results in service of steel dump trailers, aluminum dump trailers, and hydraulic fifth wheels.